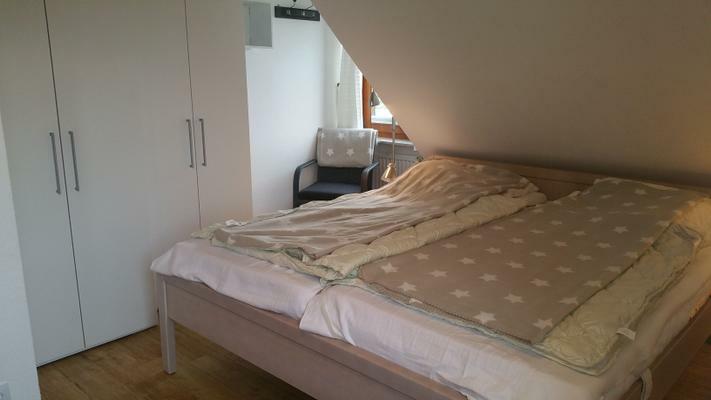 This modern holiday apartment with high-quality furnishings in the Aalhüs offers room for 4-8 people over two storeys. The town centre is easy to reach on foot. There is a large bathtub and a south-facing balcony with seating for four. The apartment has laminate flooring. 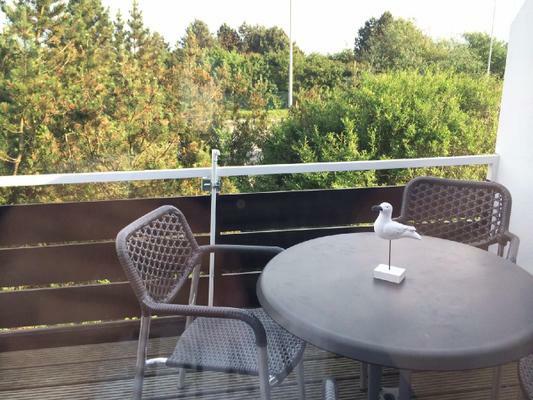 The apartment is located on the second and third floors of a detached house on the premises of a former eel smokehouse with a total of four residential units in Westerland’s Bahnweg. It has room for up to six people, with extra beds for up to 8 guests. The apartment is not located near a railway line as the street’s name suggests. The island steam railway ran along the Bahnweg from 1888 to 1970 at about 30km/h. Today “Bahnweg” is just a normal street. 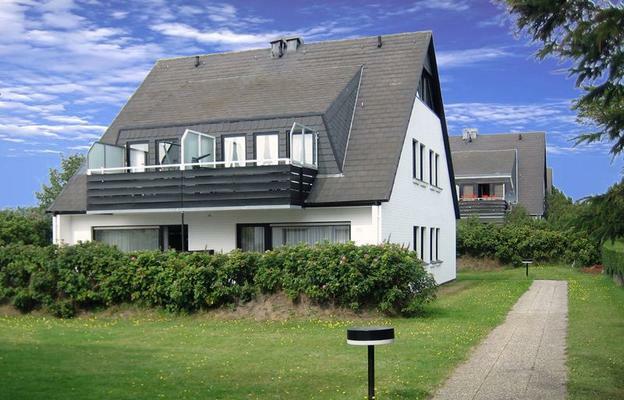 The Aalhüs is located near the city, about a six minute walk away from Westerland’s centre. The house is clearly set back from the street behind a wall, with tall pine trees and a large parking lot (see photo). 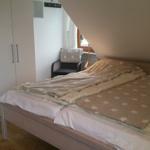 The bedroom is quietly situated towards the back. 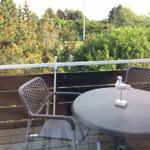 Opposite the building is the water conservation area, which means that you can enjoy green views from the living room. The apartment’s ceilings are panelled with light-coloured wood, its furnishings are for the most part made of pine wood and its floorings have been laid in English laminate. On the second floor you will find a living room with an open, integrated kitchen, installed in 2010, in which a dishwasher, stove etc. are available. The living room contains a modern black lounge suite for six people as well as a dining table. In addition to this there is a telephone, a high-quality hi-fi system and a large flat-screen TV, as well as a DSL internet connection. Leading from the living room is a south-facing balcony with further seating. In addition, the second floor offers a lavish bedroom with double bed. Here you will find a spacious wardrobe and a dresser with plenty of storage space. The white bathroom contains a toilet, basin and bathtub. The bathtub is equipped with a large, fold-out shower screen. 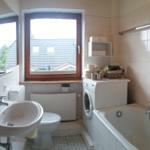 In the bathroom you will also find a washing machine that is available to you free of charge. On the third floor you will find a large room with a long row of windows and two beds at each end of the room. For group trips of 8 people, two wide air beds can be set up in the middle of the room upstairs, so that six beds are available upstairs and two below. The airbeds are 60cm thick, approx. 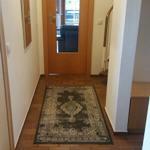 160cm wide and 200cm in length. 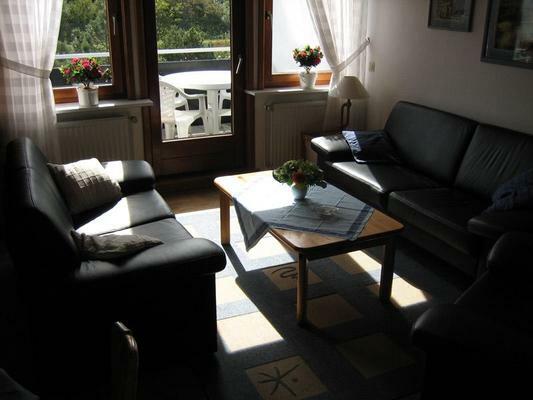 On the upper floor you also have the opportunity to relax in front of a flat-screen TV. Adjacent to this room is a walk-in wardrobe and a small bathroom with toilet and basin. The apartment has its own parking space directly in front of the house. Garden areas are available around the perimeter of the house are for playing ball games or the like. 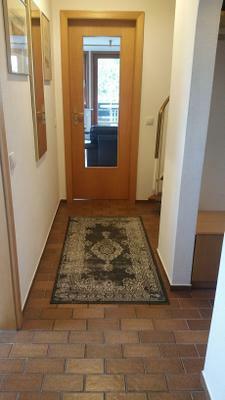 There is a DSL flat-rate connection with 6000 MBit, which is included in the rental price. Access to wireless internet from your laptop is possible free of charge using a code. For a one-off fee of €15.00 per person we can make your beds for you before arrival and lay out towels, however, you can also gladly bring these things with you. Please take note of the minimum booking period indicated, whereby we prefer guest change-overs to take place on Saturday or Sunday. Outside of the peak season other days are also possible upon consultation. Our vacancy table is always up-to-date, all green periods are vacant. Please make your enquiry using the system and only call us for Last Minute bookings. I check my emails every day and answer quickly. On the day of departure you must leave the property by 12:00 at the latest. Stays of 5 nights or more can be booked at a discounted price of €131.00 per night. Stays of 7 nights or more can be booked at a discounted price of €99.00 per night. Stays of 7 nights or more can be booked at a discounted price of €56.00 per night. Stays of 10 nights or more can be booked at a discounted price of €182.00 per night. Stays of 14 nights or more can be booked at a discounted price of €162.00 per night. Stays of 7 nights or more can be booked at a discounted price of €121.00 per night. Stays of 7 nights or more can be booked at a discounted price of €97.00 per night. Stays of 7 nights or more can be booked at a discounted price of €92.00 per night. Stays of 5 nights or more can be booked at a discounted price of €182.00 per night. Stays of 7 nights or more can be booked at a discounted price of €152.00 per night. Stays of 4 nights or more can be booked at a discounted price of €55.00 per night. Stays of 5 nights or more can be booked at a discounted price of €172.00 per night. Stays of 7 nights or more can be booked at a discounted price of €142.00 per night. Stays of 5 nights or more can be booked at a discounted price of €142.00 per night. Stays of 7 nights or more can be booked at a discounted price of €85.00 per night. Stays of 7 nights or more can be booked at a discounted price of €202.00 per night. Stays of 14 nights or more can be booked at a discounted price of €192.00 per night. 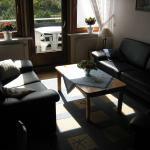 Stays of 5 nights or more can be booked at a discounted price of €50.00 per night. Stays of 5 nights or more can be booked at a discounted price of €233.00 per night. Stays of 7 nights or more can be booked at a discounted price of €223.00 per night.